When the asters bloom in profusion, it’s no longer possible to avoid acknowledging that the season is changing. Back up to Fish Lake today, and the meadows are taking on a tinge of gold. The tall swirly stalks of hellebore are drying, and the finely dissected leaves of sweet cicely are yellowing. There are still drifts of red paintbrush and white yarrow, but the goldenrod is opening. 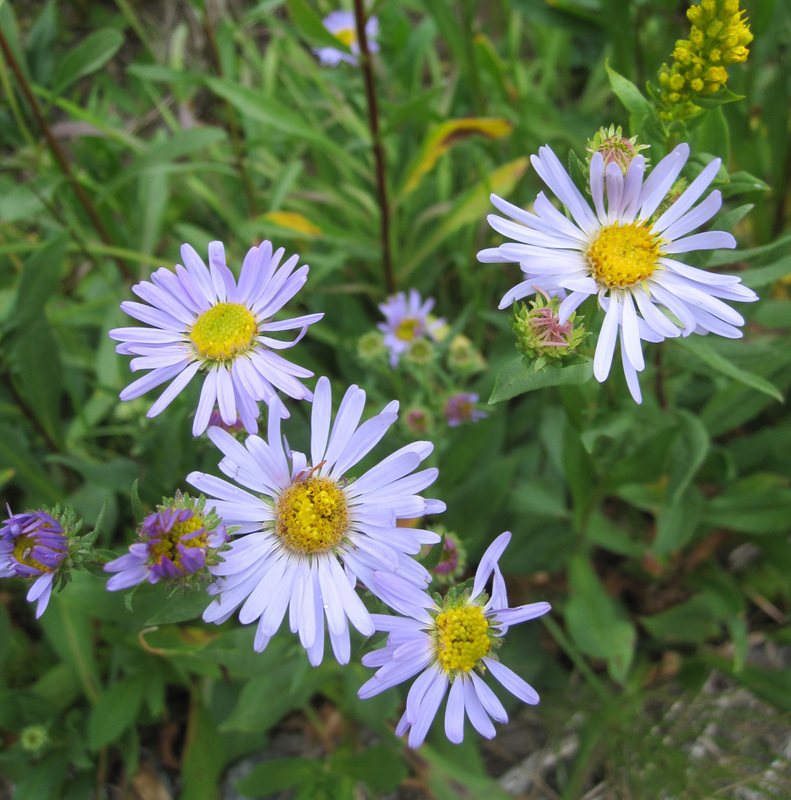 And then there are the asters–one of the last mountain wildflowers to bloom. Sigh. Summer has been too short. We climbed up above five thousand feet in elevation. Mats of phlox are just fading, and there are still shooting stars. These flowers follow the melting snow. There are still enough mosquitoes to require headnets. The day was muggy and warm, but a wind from the west brought clouds and a few sprinkles of rain. Not enough to settle the dust, but still rain. Down by the Cle Elum River, the huckleberries are ripe and tasty. Some of the leaves are showing a hint of warm color. Admit it. The season is turning. Take comfort in knowing life is circular. Notice the small wonders each day. To read through your blogging, I discern you are more of a spring and summer person than I… I love every day of every season… but my special favorites are the autumn and winter.. their flowers, their lighting, their sorts of storms… the late summer and early autumn jungle that hedges our roadways here is a most favorite thing of mine… it’s heavy, varied, profuse, tangled, a continuous, serpentine Garden of Eden… more beautiful than any human could create by design.